The Meaning of "sheet metal screw"
"sheet" is from "sceat", spoken by people in England during 450-1100 A.D.
"metal" is from "metallum", spoken by ancient people in central Italy around 700 B.C. which is from "metallon", spoken by people of Greece starting about 1000 B.C. drive, head, thread are parts of "sheet metal screw"
Rod with deep spiral threads the entire length and with one pointed end and a head on other end. Holds thin metal sheets together. Holds well in wood. Manufactured from metal. Can be rotated into or out of the object using a screwdriver or wrench. I set a sheet metal screw on the magnetic tip of my cordless drill. 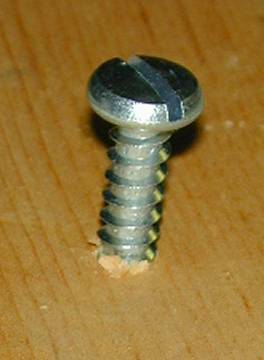 A sheet metal screw may be used in wood however a wood screw should not be used on metal.